Find accommodation in Korea, Seoul, Daegu and Busan during your stay! We'll make suggestions based on your needs. If you see one that you like, we'll make sure it's yours. Your preference. Your price. A few months prior to your arrival in Korea, our team will work with you to figure out your preferences for your accommodation in Korea, the features you need, and the price you want to pay. With the information we receive from you, we will connect with the landlords that we partner with to find you something that fits your criteria. Our partners are trusted sources who we know and are frequently in contact with. We will send you the details of the accommodation in Korea, complete with pictures, information on the monthly rate, and other specifications. If the choice works for you, we will guide you through the contract process and ensure that everything is ready for you. If the accommodation choice doesn't work for you, we will continue with the search until it does! BELOW YOU WILL FIND EXAMPLES OF OUR ACCOMMODATIONS AND RATES, EXACT ACCOMMODATIONS WILL DEPEND ON AVAILABILITY AND SEASON. Our partner landlords sometimes offer special deals that are exclusive for all Go! Go! Hanguk students. For example, Borderless House, an excellent sharehouse source, gives all of our students a 30,000KRW discount of all their listed rates each month - regardless of the room. Go! Go! Hanguk maintains a list of trusted, high-quality housing providers. Borderless House is a good example of a great company that we're proud to work with. More than half of the tenants in most of the places available to rent are Korean. Such a living arrangement allows you the opportunity to start making Korean friends from day one, as well as practice your Korean when you’re home. You may wonder what a sharehouse is. A sharehouse is a high-end luxury apartment that is shared by a group of people. In it, you can either rent your own private room, or share one with other tenants of the same gender. It's a great option for affordable and quality housing. In a sharehouse, couples are not, for the most part, allowed to live in the same house. Family and friends are welcome to visit, but cannot stay overnight. As a general rule, it is always best to check with your landlord beforehand! There aren’t curfews held in sharehouses, so you can come and go as you please. Smoking is usually prohibited inside the houses. You will be able to share the kitchens, showers, toilets, and laundry rooms with the other tenants. The houses have a common living room where you can hang out with your fellow tenants, watch TV, play games, and socialize. There is also fast and reliable Wi-Fi available for everyone’s use! If you opt to have your own personal room, it also includes Wi-Fi, a private toilet, shower, bed, and desk. Such mini-studios are open 24 hours a day, so you are free to stay out later and not worry about a curfew or being locked out. There are no additional charges for amenities like utilities. The fare you pay for a mini-studio is inclusive of electricity, gas, and water. With regard to accessibility, the mini-studios are located very close to the subway stations, so you will never be too far from where you need to go. Whether it be for shopping, tourism, school, or fun, this location ensures that it will always be convenient for you to explore Korea. If you don't want to worry about meals, the mini-studios provide free rice, kimchi, and seasonings. Some places even provide things like eggs, noodles, tea, etc. that will keep you nice and fed. The best way to be immersed in the Korean experience is to live with a Korean family! A homestay is a great way to learn about the Korean society and customs from the moment you arrive, and this can be a great experience for you. If you live with a Korean family, you'll have to practice your Korean every day, and this is guaranteed to help you pick up the language quickly. Even better for you is the opportunity to enjoy the benefits of a home away from home: the family you stay with can help you settle in faster, get to know the neighborhood and city from the viewpoint of a local, and best of all, provide you with home-cooked meals twice a day! With homestays, you pay a flat fee per month, and this fee includes any utilities you'll use (electricity, gas, water, internet). You can then choose from two meal payment options, depending on how many meals you would like included: 215,000KRW per week for breakfast only (B&B), and 285,000KRW per week for breakfast and dinner (half-board). Living with a host family will also mean living by their rules. Generally, you’d need to be home for dinner each night, and some families may have a curfew after a certain time in the evening (usually 10 or 11PM). It's also best to first ask if you're unsure as to whether you’d be allowed to do something such as inviting friends over. WILL I GET THE PLACE I WANT? As a team, we will always do our utmost to help you get the accommodation you desire. If the specific place you're interested in is not available, we will try our best to find something similar to it! HOW FAR IN ADVANCE CAN I BOOK A PLACE? This depends on the type of the place you've selected, as well as the landlord. Normally, this process begins about two months prior to your arrival in Korea. However, if you're already in the country, you can generally move in right away if the accommodation is available. Of course, you are always free to relocate! If you decide you want to try out the homestay option for three months and then move into a sharehouse, that's no problem at all. Simply let us know in advance! Note: This is one genuine example of many shared houses in Korea. The exact rent of each house depends on the size of the room and the quality & location of the house. 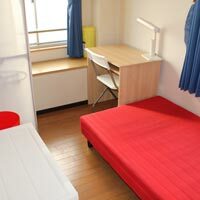 Note: Mini-studios, or Goshiwon, are low-priced accommodation normally used by university students. The numbers above are average. Some mini-studios are cheaper, some are more expensive. Note: Living with a host family always includes your own private room. Note: The price is various with the options of type of the rooms and the length of the terms. Your coordinator will guide you based on your budget and needs. Note: Most of the dormitory rooms are 1 room for 2 people. The price is various with the options of type of the rooms and the length of the terms. Your coordinator will guide you based on your budget and needs.